The Boeing Company [NYSE: BA] has delivered the 50,000th Combat Survivor Evader Locator (CSEL) combat search and rescue communications system to the U.S. joint services. The expanded use of this system will greatly enhance the capability of U.S. forces to quickly authenticate and rescue downed pilots or combat forces. CSEL was first authorized for use in theater by U.S. Central Command in 2005. Developed by Boeing, the network-enabled, multifunction radio system allows rescue teams to precisely locate isolated personnel by using multisatellite, over-the-horizon secure communications and GPS. The system provides real-time communication capabilities and enhanced coordination with isolated personnel. 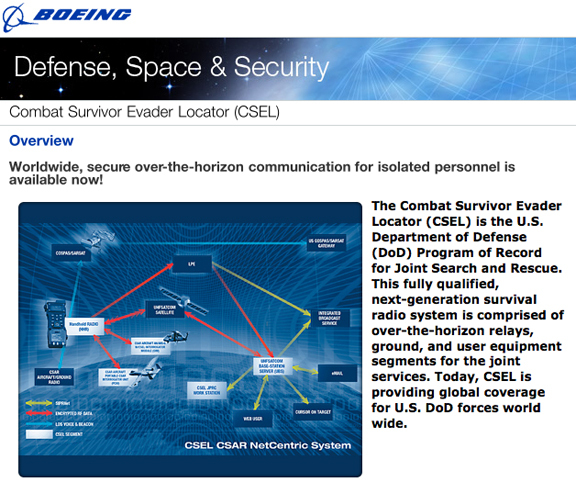 The CSEL system is the Department of Defense's program of record for combat search and rescue communications. The radios also are available to other U.S. government service branches through the General Services Administration.